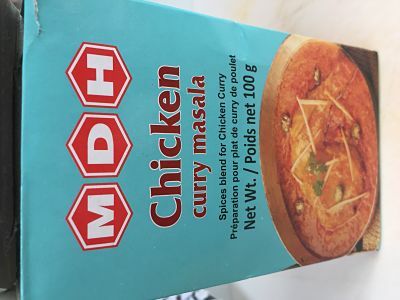 MDH Chicken Masala today, I will be using chicken thigh meat again today. I’m removing the meat and adding the bone for added flavours, stock. Goodness this was a tasty treat for us tonight, soft succulent chicken. Spicing was 2 tablespoons of MDH and 2 of Mix powder 1 tsp salt. I also used Garabi tonight and no water. I have in the past used Laziza Chicken Masala but find it particularly hot. We mopped up tonight’s meal with Pitta, so so good. Slow cooked after the initial fried Bulb of Garlic and tarka added, we also initially cook outdoors now. Once the tarka is cooked and Garabi added it’s welcome indoors. Please excuse the messy bowl. A nice oily curry, CC. Well done ! 3 chefs spoons of vegetable oil and 20g butter, Phil this amount served 4 people’s. Photo is a single portion, I find if oil is correctly cooked from a curry it gives a oily appearance, infact very little here it’s just all visually floating. off the back of the MDH box? I find if oil is correctly cooked from a curry it gives a oily appearance, infact very little here it’s just all visually floating. Interesting view on oil, can you explain a little further. No not from the box Chewy I should imagine the large amount of Haldi in my mix would classify it more Punjabi’s but it’s Fusion, tradition method with Bir Garabi. 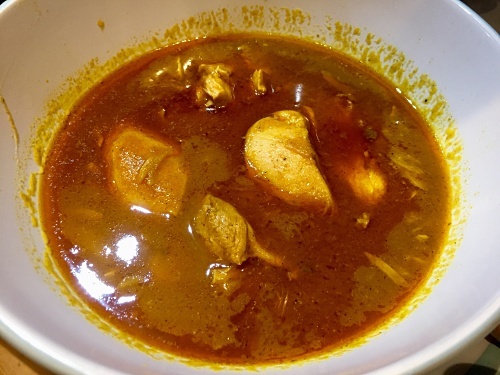 Traditional in the sense of a long slow cooking releasing all the oil to float, Medium Chicken Curry is then ladled per serving from the bottom of pot. Oil is the last ladle then added from the top tradition. Oil is best moped up with fresh Roti/Naan, unfortunately my day was cut short so Pitta was a substitute. Best wishes.